100 Years ago today, a great American chef, author and television personality was born. 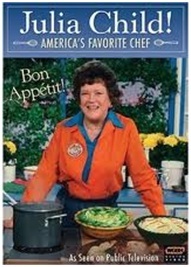 Julia Child was well-known across the country for bringing French cuisine to the American public. Born on August 15, 1912 in Pasadena, California, Julia became the inspiration for many to don their chef uniforms and become master chefs themselves. After attending Le Cordon Bleu cooking school, Julia co-wrote a French cookbook with Simone Beck and Louisette Bertholle, in order to make the book appeal to Americans. In 1951, Julia (along with Beck and Bertholle) began teaching American women to cook in her Parisian kitchen, calling the informal culinary school, L’école des trois gourmandes, or The School of the Three Food Lovers. Later in her career, Julia was the star of many television programs, including Julia Child & Company, Julia Child & More Company, and Dinner at Julia’s. Julia died of kidney failure just two days before her 92nd birthday on August 13th, 2004. 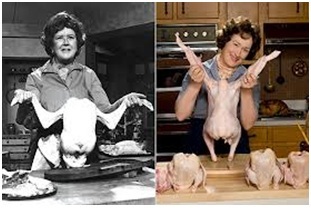 However, she still serves as an inspiration to many, as is evident by the film Julie & Julia. The 2009 film contrasts the life of Child (played by Meryl Streep) in the early years of her culinary career with that of a young, aspiring New York chef who decides to cook all of Child’s 524 recipes from her cookbook in just 365 days. Today, we honor her life and her success. 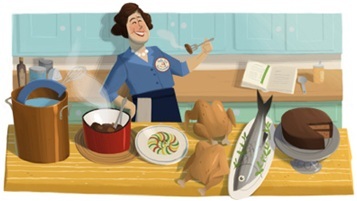 Even Google’s gotten into the spirit with a Julia Child Google Doodle! Who is your inspiration for doing what you do? How do you honor them? Leave a comment below and tell us!